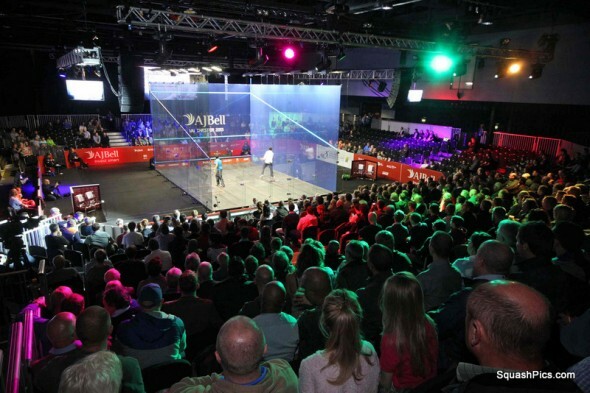 Egypt’s world number one Ramy Ashour and England’s world No4 Nick Matthew will meet in an eagerly-anticipated AJ Bell PSA World Squash Championship semi-final in Manchester on Saturday after both prevailed in straight games quarter-finals at Manchester Central. With six world championship titles between them, it was no surprise that the opening quarter-final between fourth seed Matthew, the two-time champion from Sheffield, and eighth seed Amr Shabana, the four-time winner from Egypt, would be a world-class encounter. And judging from the oohs and aahs surrounding the new all-glass court at Manchester Central, that’s how the near capacity crowd felt about the spectacle they enjoyed. Matthew was in commanding form as he raced to a 4-0 opening lead – but maestro Shabana pegged back the deficit to a single point before the Englishman again moved ahead. The 34-year-old left-hander from Cairo saved two game balls from 10-6 but it was Matthew who went 1/0 up. A similar pattern emerged in the second, with Yorkshireman Matthew taking a 3-0 lead without reply. Shabana was unable to stem his opponent’s lead as Matthew stormed on to take a 2/0 lead. World No4 Matthew took the first point in the third, but for the first time in the match Shabana overtook his opponent to lead 4-1. It was short-lived, however, as errors crept into the Egyptian’s game while Matthew dug deeper. Shabana saved a single match-ball, but Matthew ended the next rally by smashing the ball well beyond the Egyptian’s reach to record an 11-8, 11-4, 11-7 victory after 43 minutes. “I can’t get too carried away by that win,” Matthew told MC Andy Kay afterwards. “I’ve got to keep my feet on the floor – there are two rounds to go yet. “He’s such a great player. I was really nervous today as he’s coming back from injury – so I felt the pressure was on me. “I feel I’m in the best shape of my life. I’ve changed one or two things in my training – I’m now doing yoga, for instance. “I’ve been inspired by a quote I saw recently on the wall in my gym at the EIS: ‘If you’re not nervous, you’re not ready’. When asked about the influence of Rugby League star Ellery Hanley, who watched the match from the front row, Matthew said: “Ellery has been great to me. We speak quite often. He doesn’t say a lot, but what he does say is worth hearing. Shabana admitted he was slightly off the pace, but was pleased with his performance in his first event after an eight-month layoff with a liver complaint – which resulted in him being confined to bed for a total of 28 days. “I’m pleased to have reached the quarter-finals of the world championship after what I went through,” said the former world number one. “I went half way, so you have to be optimistic. “Nick was very sharp tonight – he did everything right and I was a bit off the pace. You can’t play somebody like Nick unless you’re 100% and I would say I was about 60% tonight. “I know I can improve – I just need more match practice. I only led for the first time in the third game. I was always playing catch-up – and usually it’s my opponents who are playing catch-up! “Usually when you lose, you are unhappy,” continued Shabana. “But I don’t feel like that – and I want to get back home to continue training. In the day’s other quarter-final, favourite Ashour faced unseeded Saurav Ghosal, the world No17 from Kolkata who has made history by becoming the first Indian ever to reach the world championship quarter-finals. By contrast, it was the Egyptian’s fourth successive last eight berth in the championship – which he won both last year and in 2008. Ghosal, who went into the match without having previously beaten Ashour in four meetings, made an impressive start – leading 8-4 and 9-6 in the first game. But the 26-year-old from Cairo – later described by Ghosal as “the most original squash player I have ever seen” – pulled out a succession scintillating shots to recover the deficit and take the game. Ashour quickly built up a 9-1 lead before taking game two. It was nip and tuck throughout the third until nine-all. After a long rally, Ashour played a deft backhand volley into the nick, then clinched the match after a further lengthy exchange which concluded when Ghosal put the ball into the tin. Ashour admitted later that he’d had hospital treatment that morning for “a niggle in my leg”. “I was very happy with the win tonight,” Ashour told the crowd after his 11-9, 11-5, 11-9 victory. “But it’s not just the win, it’s the story behind the win!” He continued by thanking a host of people who had enabled him to achieve his victory – adding “and the venue here is amazing”. “For the last three days, I haven’t been enjoying my squash,” conceded Ashour later to the event’s media. “I’ve been like a machine. It’s been too hard – all my problems over the past few years have come back, including my groin and my hamstring. 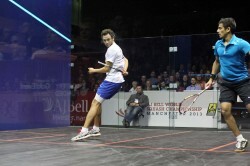 When talking about his opponent later, Ghosal said: “Ramy can produce performances right now that nobody can top. I feel privileged to have played in his era – what we have in Ramy is something very special. “I think I played pretty well tonight in the first and third games – I think I handled myself OK. If I’d won the first game, it could have made a big difference.